Every once in a while a cookbook comes along that speaks to me, in a language I know and love: the language of seasons, gardens, homsteading, family and food. 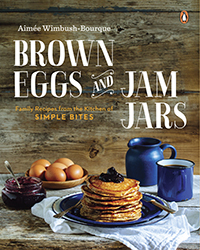 And when Brown Eggs and Jam Jars, a newly released cookbook by Aimée Wimbush-Bourque of Simple Bites, it spoke that language, a language of love and family and good cooking. As I thumbed through its pages, stumbling across recipes for Blueberry Cardamom Butter, Slow Cooker Cider Ham, and Caprese Salad with Fresh Thyme Drizzle, I knew that its a language that you’d appreciate as much as I do. 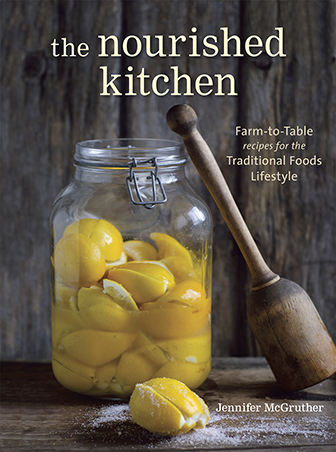 Brown Eggs and Jam Jars is more than a cookbook; rather, Aimée expertly interweaves a primary focus on whole foods recipes with tips on homesteading, preserving the harvest, and celebrating local foods. 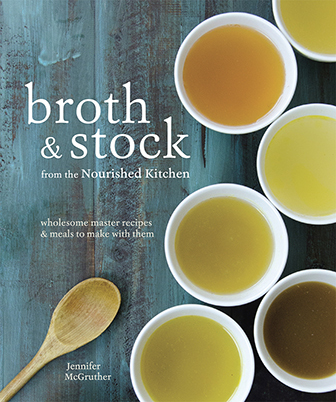 Yet, still, at the heart of the book is another message, one deeply rooted in love: that of returning to the family table, of teaching children where their food comes from and why it matters. It’s simple home cooking with a purpose and a message. 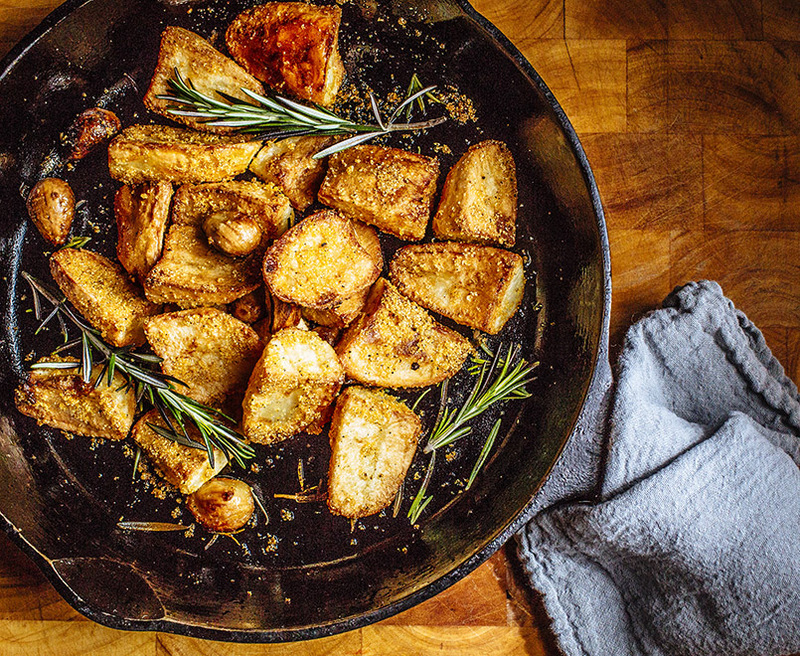 While the recipes in Brown Eggs and Jam Jars are blessedly simple in their approach (think: Cinnamon Applesauce, Peaches Preserved in Honey Syrup, and Strawberry Lemonade), they are also inventive as little additions like cornmeal added to the Crispy Rosemary Roast Potatoes below elevate everyday family cooking into something worth celebrating. More than that, Aimée brings us back to the table with her emphasis on the old-fashioned Sunday dinner, a tradition that makes wholesome foods, togetherness and family a priority. Me? I couldn’t agree more. What I appreciated the most, beyond the many recipes included in the book, was the many practical, and actionable tips that are included with in its pages. She discusses how to talk to your kids about where their food comes from, including sometimes touchy and emotional revelations about meat. The pages are also peppered with tips and guidance about how to regularly involve children in the kitchen and in sourcing their food: whether making taffy, helping with compost, going on orchard tours or just learning how to cook as a family. It’s particularly helpful information for families with young children. So, inspired by her book, my family included one of her recipes in our regular Sunday dinner this past week: Crispy Rosemary Roast Potatoes. Again, simple and uncomplicated, wholesome cooking that everyone in our family enjoyed. It paired beautifully with Roast Chicken, and a homemade gravy. Done just right, crispy roasted potatoes are a perfect side for Sunday dinner, and can accompany any sort of roast. They can also double as hash browns alongside eggs and bacon for brunch, should you prefer to sleep in. My version, one of the most popular recipes on Simple Bites, uses cornmeal to coat the potatoes. This crunchy addition, combined with a high cooking temperature, ensures an utterly crispy potato with a moist, fluffy interior. A cast-iron pan yields the best results. Position a rack on the lowest level of the oven and preheat oven to 425°F. Cut each potato in half, then in half again, until you have 4 evenly sized chunks per potato. Place in a medium pot with 1 teaspoon of the salt, cover with cold water and set over high heat. Bring potatoes to a boil, then reduce heat slightly and boil for 2 minutes. In a large bowl, mix together cornmeal, remaining 1 teaspoon salt and pepper. Drain potatoes, then transfer to the bowl with the cornmeal and toss gently to coat. In a 12-inch cast-iron pan or heavy skillet, heat olive oil over high heat. When small bubbles begin to rise (but before oil is smoking) and oil is very hot, add rosemary and garlic. Stir carefully with tongs for a minute to infuse the oil. Carefully add cornmeal-crusted potatoes all at once to the hot oil and arrange them with your tongs so that they are evenly distributed around the pan. Place the skillet in the oven and roast for 15 minutes. Carefully remove pan from oven and turn each potato so the crispy side faces up. Roast for another 20 to 25 minutes or until golden all over. Using a slotted spoon, transfer potatoes to a serving platter. Sprinkle with chopped fresh rosemary and a sprinkling of sea salt if desired. Serve at once. Don’t toss the oil from the pan. Instead, let cool, then strain through a coffee filter or fine sieve and reserve for roasting vegetables. From Brown Eggs Jam Jars, copyright Aimee Wimbush-Bourque, 2015. Reprinted by permission of Penguin, Canada, a division of Penguin Random House Canada Limited. Photography credit: Tim and Angela Chin. I bring my rosemary plant indoors all winter so that I have fresh rosemary flavor to work with, love that woodsy flavor so much. You nailed, these simple, delicious potatoes are so perfect with a good roast on a Sunday. Yours look absolutely to die for, I’d eat every single one without stopping. Crispy is just the right word! YUM! Love that you added an extra crispy element to already delicious looking potatoes! Sounds wonderful, but one should not use olive oil for high heat cooking. It destroys the benefits of the oil. Use olive oil on your salad and try a different oil, such as sunflower or grape seed for high heat cooking. Hi Ellen, I disagree. I think olive oil is perfectly fine for this approach. Olive oil is mostly a mono-unsaturated fat that is heat-stable at moderate temperatures like those required in cooking this dish. Yes, some of the phytonutrients would be destroyed by cooking, but that’s not isolated to olive oil. If you eat plenty of vegetables and fruits, you’re getting plenty of phytonutrients such that you needn’t worry about the minute quantity lost in a heated olive oil. I use sunflower oil on occasion, too, for its neutral flavor; however, I do not use or recommend grapeseed oil as it is high in polyunsaturated fat that is not as heat-stable as the monounsaturated fat found in olive oil. Hello, I always love reading your blog, but now I have a question, I recently heard that Grape seed oil is not good for you, now I use Avocado oil when I cook or fry something, do you think it is a good choice? I also use a lot of Olive oil, but only for cold dishes, my husband puts it even in his yogurt. Do you have a source for non-GMO cornmeal? Any organic cornmeal or blue cornmeal will be non-GMO. So it is not true then, that some corn can be GMO seed yet grown organically? Nope, not true. GMOs are not allowed in organic agriculture. These look great – but I’m wondering about a sub for the cornmeal. Not sure if the recipe would work without it, but we’ve got corn allergies to contend with. Any ideas? Made these tonight. Very yummy. I had two other things in the oven at a lower temp – so I ended up spending another 20 minutes or so in front of the pan on the stovetop. for this i will plan better next time. these are significantly better than the “oven-roasted potato wedges” I have made before. I learned a few new tips from this! Thank you for sharing! I made these last night, using small russet potatoes. They turned out amazing! My husband wanted them again for breakfast. So crispy on the outside and fluffy on the inside, and a great use for our abundance of fresh rosemary.